Focal Press has announced the publication of its $59.95 Adobe Photoshop for Photographers, 2014 Release by Martin Evening. "The Photoshop products continue to evolve alongside the photographers and designers who use them," Evening said. "Even advanced photographers are only scratching the surface of the product's potential and it is my hope that I can help digital artists maximize Photoshop CC for their needs and streamline their workflow in the process." In addition to the paperback, Evening has set up the PhotoshopForPhotographers.com Web site with sample images, tutorial videos and bonus chapters. Inducted into the Photoshop Hall of Fame in 2008, Martin Evening is a professional beauty and portrait photographer based in London and an expert in both Adobe Photoshop and Lightroom, have written many books on these subjects. 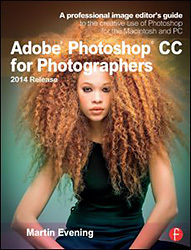 Just published by Focal Press: Adobe Photoshop CC for Photographers, 2014 Release. Focal Press has published the $59.95 Adobe Photoshop for Photographers, 2014 Release by Photoshop hall-of-famer and acclaimed digital imaging professional Martin Evening has been fully updated to include detailed instruction for all of the updates to Photoshop CC 2014 on Adobe's Creative Cloud, including significant new features, such as Focus Area selections, enhanced Content-Aware filling and new Spin and Path blur gallery effects. This guide covers all the tools and techniques photographers and professional image editors need to know when using Photoshop, from workflow guidance to core skills to advanced techniques for professional results. Using clear, succinct instruction and real world examples, this guide is the essential reference for Photoshop users of all levels. Accompanying the book is the PhotoshopForPhotographers.com Web site with sample images, tutorial videos and bonus chapters. Inducted into the Photoshop Hall of Fame in 2008, Martin Evening is an internationally renowned professional photographer. Working principally on studio-based beauty photography, Martin uses Photoshop to retouch or manipulate to some degree nearly every image he produces. This regular everyday experience with the software has enabled him to gain extensive specialist knowledge of Photoshop.